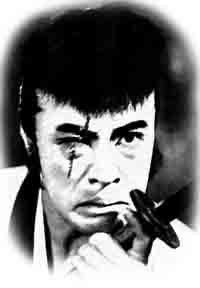 I’m still kind of embarrassed creating a site with my own name in the address, so the least I can do is give it an extra name, honoring one of my favorite characters from Japanese cinema: Tange Sazen, the one-armed, one-eyed ronin most famously played by the great Okochi Denjiro. This site introduces some of my research on Japanese and East Asian film and media as well as offers tidbits of news and opinion. I focus mostly on English-language resources, but I have a Japanese (日本語) section that introduces some of my activities in Japanese. I teach Japanese and East Asian cinema, media, and culture at Yale University in the USA, where in particular I help run a unique combined doctoral program in East Asian cinema between the Department of East Asian Languages and Literatures and the Film and Media Studies Program. I received a MFA in film studies from Columbia University, a MA in Asian Civilizations from the University of Iowa, and a PhD in Communication Studies from Iowa. I spent nearly 12 years in Japan working for the Yamagata International Documentary Film Festival and teaching at Yokohama National University and Meiji Gakuin University. I have published numerous works in English, Japanese and other languages on such topics as Japanese early cinema, contemporary directors, film genre, censorship, television, Japanese manga, and cinematic representations of minorities. I wrote film reviews for the Daily Yomiuri newspaper (now called The Japan News) for nearly 12 years and selected the best ten Japanese films of the year for Eiga geijutsu, one of Japan’s longest running film magazines. My most recent books are on early Japanese film culture, Kitano Takeshi and A Page of Madness. I've also written the Research Guide to Japanese Film Studies with Abé Mark Nornes, which has recently been updated and translated into Japanese, as well as edited an anthology of Japanese film theory. A short CV is available at my Yale profile. You can also try a search for "Aaron Gerow " on Amazon. Check out the menu on the upper left for introductions to many of my books and articles. I have also made some of my work available on the Yale repository if you want to read it.